Throughout 2017, with the support of the Royal Society’s Local Heroes scheme, Stromness Museum celebrated the life and work of the Reverend Charles Clouston, the first President of the Orkney Natural History Society, and an active President from its inception in 1837 until his death in 1884. 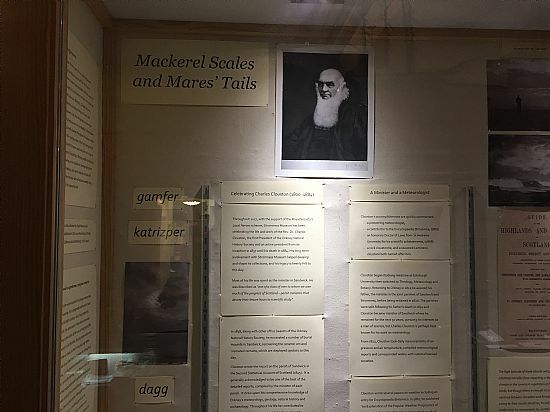 His long-term involvement with Stromness Museum helped develop and shape its collections, and his legacy is keenly felt to this day. Rev Dr Charles Clouston (15 February 1800 – 10 November 1884) was born in Sandwick, Mainland, Orkney to Isabella (née Traill of Holland) and Rev William Clouston (1747-1832). His father was the Minister for Sandwick and Stromness, who was particularly noted for the comprehensive accounts of these parishes he produced for the Old (First) Statistical Account of Scotland (1790). 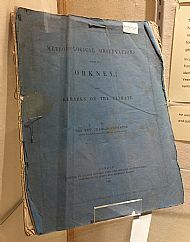 As a polymath with broad scientific interests in natural history, geology and meteorology, Clouston was a key figure in the founding of the Orkney Natural History Society in 1837 and the establishment of the Stromness Museum. 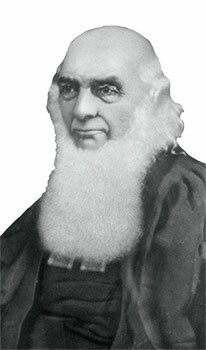 He was the first President of the Society and served for 47 years until 1884. In 1838, shortly after the formation of the Society and with the intention of obtaining antiquarian artefacts for the museum, Clouston, supported by the Office Bearers of the Society, excavated a number of tumuli in Sandwick. These antiquarian excavations recovered a ceramic urn and cremated remains, which are displayed in Stromness Museum, and a piece of copper and a boar’s tusk that have not yet been located in the collections. In 1839, Clouston followed in his father’s footsteps by producing an exceedingly comprehensive account of his parishes for the New (Second) Statistical Account of Scotland. This account included considerable detail on prehistoric monuments in Sandwick and a description of the barrows he excavated. Despite his many other achievements, Charles Clouston is best known for his work on meteorology. 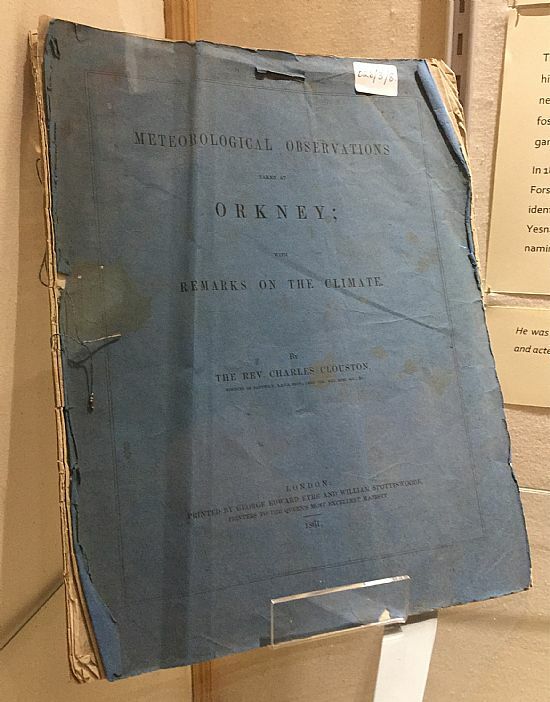 From 1822 until weeks before his death 62 years later, he took daily measurements and compiled reports for the Meteorological Society, which were frequently commended. 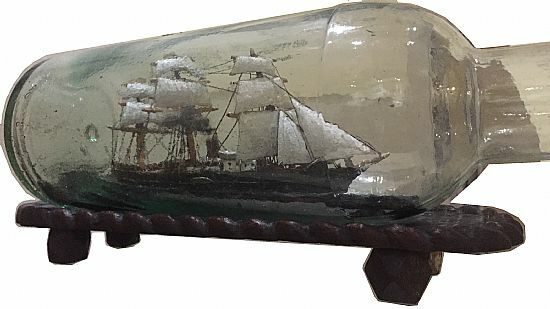 Admiral Fitzroy, the Captain of HMS Beagle on Charles Darwin’s famous voyage, who in 1854 established the organisation that later became the Met Office, took particular interest in Clouston’s research and loaned him one of only two improved government anemometers. Clouston wrote several papers, including a treatise on predicting Scotland’s weather (1867) and an entry for Encyclopaedia Britannica. In February 1868 the University of St Andrews conferred Clouston with an honorary Doctorate of Laws (LLD) for his scientific attainments. Clouston worked tirelessly for his parishes and the advancement of science until his death aged 84. He contributed to many areas of scientific research and was widely respected in Orkney and beyond. His long term involvement in Stromness Museum helped develop and shape its collections, which remain a valuable resource to this day. The Revered Charles Clouston (1800-1884) was one of the founding members and the first President of the Orkney Natural History Society, and this year we are celebrating Clouston’s life with a diverse programme of events thanks to one of only 15 national scientific Local Hero awards from the Royal Society. Clouston remained an active president until his death in 1884 and was a key figure in the development of what is an exceptional local museum that continues to be a valuable educational resource as well as an enjoyable visitor destination in the 21st century. Clouston began studying medicine at Edinburgh University then switched to theology, meteorology and botany. Returning to Orkney at the age of 22, this young man began keeping records of air temperature and air pressure that he continued throughout the rest of his life. Clouston was a pioneering meteorologist. From 1827 he took daily readings of air temperature and air pressure sharing his records with national learned societies and corresponding with meteorologists in many different countries. Amongst other features he noted the relationship between conditions at sea and the weather which followed. 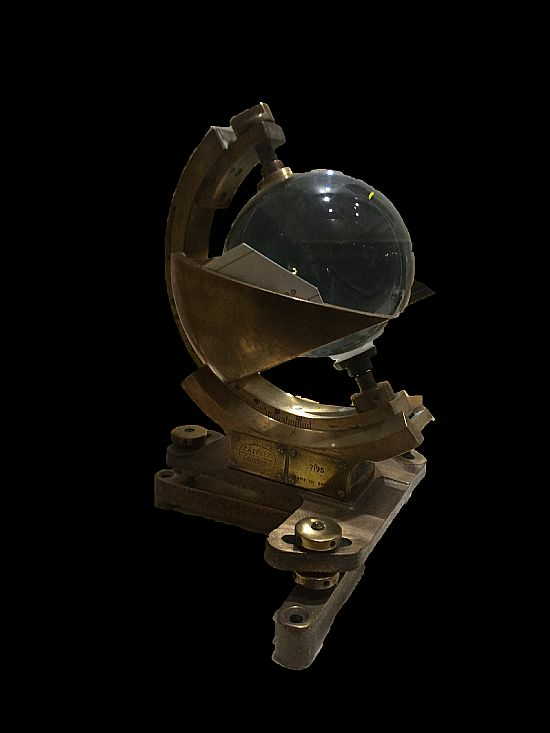 In the 1850s when Admiral Fitzroy at the Board of Trade was developing systems for ‘forecasting’ as a way of avoiding loss of life by providing gale warnings for sailors and fishermen, he was particularly interested in Clouston’s records and presented Clouston with one of only two government owned anemometers to enable him to record wind speed. He assisted his father, the minister in the joint parishes of Sandwick and Stromness, before being ordained in 1826. When his father died in 1832 the parishes were split and he became the minister in Sandwick, where he ministered for the next 52 years. Here he also acted as the local doctor offering ‘medical advice and medicines to poor and well-off alike without fee,’ and pursued his interests in meteorology, archaeology and natural history. We can learn a lot about Clouston from his contribution to the New Statistical Account of Scotland published in 1845 and written in his early 40s. Clouston’s report on the parish of Sandwick is generally acknowledged to be one of the best of the detailed reports on each parish compiled (usually) by the minister for every parish in Scotland. He was obviously a very active and practical man, with a great interest in his parishioners and concerned about their poor conditions. The minister’s farm, or glebe, demonstrated the benefits of modern enclosed fields and crop rotation producing greater yields than most of the rest of Sandwick in the 1840s. He questions the assumptions of a fellow antiquarian that cairns of vitrified stone are evidence of beacon fires since he knows that burning sandy peats for ash for manure produces similar evidence of glass-like stone. Over his lifetime, he added considerably to the knowledge of the flora of Orkney and discovered or explored numerous archaeological sites often along with his fellow office bearers of the Society. He noted ‘little cavities which are filled up with soft bitumen or petroleum.’ Since it was expensive to bring coal into Orkney, it ‘excited some hope of discovering coal in this county.’ (NSA, p48) However, given the composition of the rock and landscape, he concludes that this is not possible. Forty years later during a geological survey in Orkney, Professor Heddle rediscovered this rock, identified it as a new bituminous mineral and named it Cloustonite. Four years later he read a paper on the climate of Orkney at the British Association of Science’s meeting in Aberdeen, where it was first announced that Darwin was about to release his findings on evolution. The arrival of the British Association and leading scientists of the time was a cause for great excitement in host communities. In Aberdeen, the Music Hall, capable of seating about 2,500 people was specially added to the Assembly Rooms, and the demand for seats during the week was so great that associate membership had to be capped. A sign of the times is the 861 women who enrolled. Clouston seems to have been a supporter of women’s education, since in his Will he left his surviving sons and daughters £500 each for education. He extended this concern to his parishioners whose housing and land he recognised required improvement. During his ministry, the parish school became one of the best in the county, whereas in the 1820s it had been reported to be at least half a century behind. Clouston’s interests illustrate the breadth and depth of traditional Scottish education and for me his life exemplifies what Lindsay Paterson, Professor of Education Policy at Edinburgh University recently described as the civic and moral responsibility traditionally taken on by Scottish professionals who shared their knowledge and supported their communities. This is borne out by the comments of the Glasgow Orkney and Shetland Literary and Scientific Society, who wrote to congratulate him in 1882 on his 50 years as the minister in Sandwick, saying he was a ‘good man and true,’ who lived what he taught, and acted accordingly to the faith he believed and loved. Please, be upstanding and lift your glasses to the Revered Dr Charles Clouston, Physician and Scientist. A sunshine recorder consists of a glass sphere mounted in a spherical bowl and a metallic groove which holds a stiff paper record card. The sun's rays shine through the sphere, and focus sharply on the record card beneath the glass sphere, leaving burnt marks on the card.